The Palenque Astronaut: Evidence of Ancient Alien Visitation? Today we are going to take a trip to another time and another place. The place is the steamy Mexican jungle and the time is 683 AD near the end of Classical Maya civilization. In the middle of the jungle we find a great city ruled by a great king, a man named Pacal, who lived to the ripe old age of 80. Under his rule Pacal’s city-kingdom flourished and great monuments were built. One of these monuments was a pyramid structure called the Temple of the Inscriptions. Inside the temple would be Pacal’s final resting place. Archaeologists penetrated the building for the first time in the 1950s. What they found would astound the professional and armchair archaeologist alike: A gigantic stone slab weighing over a ton, placed on top of Pacal’s tomb. On the surface of this slab we find a curious illustration, a man in a seated position with lots of activity below him, above him and on either side of him. We are on the internet here, the land of false dichotomies, but this carved work of art represents a true dichotomy in that it has been interpreted in two very distinct ways. One camp believes that this carved relief is proof of alien visitation because it shows a man in a space craft. The other group believes that this is an ordinary funerary illustration and that there is nothing to see here, besides the beauty of such a marvelously handcrafted work of art from so many centuries ago. Before we get into the arguments, let’s talk a little about context here. Palenque, whose Maya name was Ba-ak Lakamha, is a UNESCO World Heritage site located in the eastern part of the Mexican state of Chiapas, near the present-day border with Guatemala. The city was part of the Maya civilization, which is not to be confused with the Maya Empire, which did not exist. Maya civilization was a loosely connected group of city states sharing the same cultural elements much like the ancient Greeks. So, Palenque was an independent city-kingdom ruled by a powerful dynasty. To this day the city is somewhat shrouded in mystery. No one knows how old Palenque really is. It’s first recorded ruler is supposed to have reigned in 2325 BC, but many archaeologists regard this as a mythological king. During its heyday, between about 400 AD and its mysterious collapse around 800 AD, Palenque was home to tens of thousands of people and a powerful aristocracy. A great deal of work needs to be done on this “lost city” as only less than 10% of the city has been excavated. There are still well over a thousand buildings that have been identified but have not been cleared of the dense overgrowth of jungle Some may argue that Pacal’s tomb is the first of many depictions of astronauts yet to be uncovered. For those of you who think that the age of Indiana Jones has long past, maybe you should think about volunteering to do some work at Palenque. The opposing side bases its conclusions on years of academic research. To the Mayanist or professional archaeologist, we have to take the Palenque Astronaut in context. The carved slab was found on a tomb and many of the symbols and motifs are found in other parts of the Maya world in other forms of art. Yes, the scene depicts a long journey, but not to Alpha Centauri or the Andromeda Galaxy. 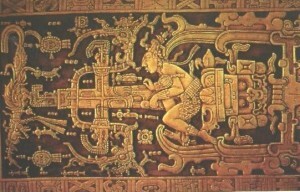 It depicts King Pacal at the moment of his death and his transition to the underworld, the land of the dead. This would be appropriate for a coffin lid. The overpowering element of this work of art is the world tree, found throughout Mesoamerica and the rest of the Maya world. It’s in the shape of a cross and symbolizes the bridge between the underworld, the heavens and the earth. The tree’s roots plunge into the underworld, giving the appearance of flames from a rocket exhaust. We see a double-headed vision serpent on the sides of the cross, which is also common in other works of art. On the top of the tree is a celestial bird, which represents the heavens. The king is seated, that is clear, but to the archaeologists it is not in the seat of an Apollo capsule. He is seated on the sun. To the ancient Maya, the sun made its journey across the sky, taking the dead with it to the underworld. So, Pacal is riding the sun to his new resting place. The sun is depicted here as being half skull. This indicates the transition to death and again, it is seen in other funerary-related carvings in Mayaland. The astronaut theorists claim that Pacal’s foot is on a pedal to somehow maneuver the spacecraft. The archaeologist claim that this is just a foot rest. According to the academic side in the dichotomy, Pacal’s hands are in delicate positions, and not on controls. Delicate hand gestures are seen in Maya art throughout the region. It’s a stylistic thing and may have some sort of fashionable significance. The final thing to look at on this slab is the astronaut’s breathing apparatus. Mayanists will argue that this is a nose plug, a form of adornment and if you look at it, it isn’t attached to anything, so there are no tubes. There you have the two sides. Some people may say that academics are too bogged down in what is perceived as practical explanations and may miss things. Careers may be on the line if you propose too wacky a theory. Some say that academia suffers from confirmation bias and peer pressure so that anything outside the accepted “norm” is discarded as rubbish and the status quo is preserved. The mainstream archaeologists have been working on the Maya for years as it is a fascinating civilization to study and a clearer picture emerges almost on a daily basis of this ancient people. The academics, however, have not been able to figure out what happened to the Maya. The last dated carving at Palenque was 799 AD and soon after the city was abandoned. Where did they go? Perhaps they all hitched rides on rockets and the ancient astronaut people are on to something here… or maybe they’re not. Jesus Malverde: Rogue or Saint?